Debris appears to strike the exterior of Space Shuttle Discovery following launch on Feb. 24, 2011. Space shuttle Discovery is chasing the International Space Station one day after blasting off on one last mission before NASA retires the storied reusable space plane. Video from launch cameras did show several pieces of foam insulation fall from Discovery's fuel tank during its 8.5-minute launch from the Kennedy Space Center in Florida yesterday, but NASA officials said the debris events occurred too late in the flight to cause any concern. A piece of foam the size of a sheet of paper reportedly fell free, officials said. "It's probably a piece of foam about 8 by 10 inches that comes off, but that's well after the area of concern from an impact-to-the-orbiter standpoint," said Bill Gerstenmaier, NASA's space operations chief. 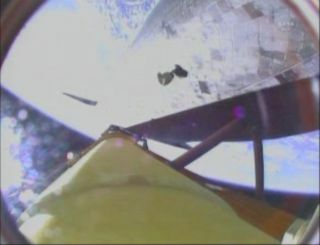 Heat shield surveys have been a standard part of every NASA shuttle flight since the 2003 loss of the shuttle Columbia and its crew due to wing damage. For their survey today, Discovery astronauts will use sensors on a 50-foot (15-meter) inspection pole attached to the end of the shuttle's robotic arm to inspect the spacecraft. Images and video will be relayed to NASA's mission control center in Houston for review. Discovery is flying an 11-day mission to deliver a humanoid robot and storage room to the International Space Station. The shuttle is due to arrive at the space station tomorrow (Feb. 26) at about 2:19 p.m. EST (1919 GMT). The mission is Discovery's final flight in space. After this flight, Discovery – the most flown of all NASA shuttles – will be retired and eventually sent to a museum for public display. NASA is retiring all three of its winged orbiters this year to end the 30-year space shuttle program.